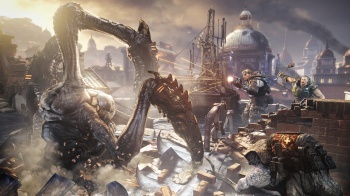 Bleszinski wants Gears of War: Judgement to kill you lots. If you happen to be the kind of gamer who thinks that modern shooters are linear, quick-time-happy snoozeathons, take heart: CliffyB agrees with you. What's more, he's taking steps to make sure that Baird and Cole Train's next adventure, Gears of War: Judgement, won't be anything like that. Apparently Bleszinski's been playing a lot of Demon's Souls recently, and he's taken his cue from that game's sharp difficulty curve. Epic Games latest Gears of War is to be challenging in the same way, and for the same reasons. "It's okay to die a few times in a game," says Bleszinski, adding "if this game doesn't make you sweat, we haven't done our jobs." There is some merit in making things a little easier on the player in order to grow an audience, but the time has come for a change in direction. Games like Demon's Souls make the player work for their achievements, and the same should apply to Epic Games upcoming shooter. Bleszinski's been playing 4-player co-op Judgement just to see what it's like, and has been pleasantly surprised by how challenging it can be, even for the man who knows Gears of War better than anyone. "I really have to hunker down and focus," he claims, "and if my buddies aren't reviving me, and we aren't working as a team, you're going to die." There will be as many surprises in his shooter as there are challenges. Bleszinski says everyone should have a unique experience, "which is interesting and cool, as opposed to, 'I came around the same exact corner and saw the same exact plane crash, the same exact enemies." There will still be a casual mode for those who just want to play through the story, but every mode other than casual will plunk the player knee-deep in carnage - and make him sweat for his successes. Gears of War: Judgement is due in 2013.